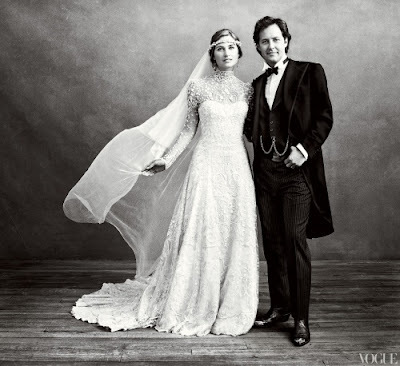 Romantic style meets rugged terrain for a "rustic elegant" wedding joining Lauren Bush and David Lauren. I've never been a big fan of themed weddings, but this one and Kate Moss's wedding are making me rethink that opinion. I guess I just don't like over-the-top, cheesy themed weddings. Save those for Cinco de Mayo, Oktoberfest, and Mardi Gras parties. 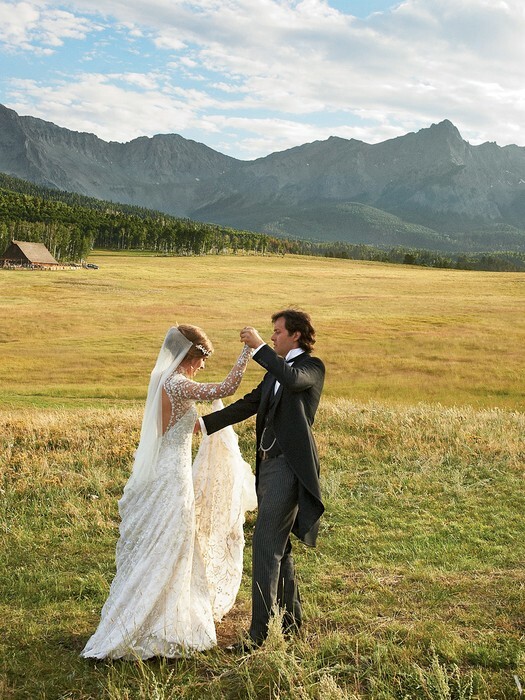 The wedding location was Ralph Lauren's 17,000-acre Double RL ranch in Ridgeway, Colorado. If you haven't seen the episode of Oprah going to Ralph's ranch I highly suggest it. It was one of her last five episodes and it's not going to be erased from my DVR ever. The view is majestic. Rolling hills, jagged mountains, and the biggest open sky you can image. They married in front of a modest number of 200 people in the fashion, celebrity world they live in. The reception was held in a nearly 200-year-old barn, decorated with white, cream, and blue flowers. Lauren described her dress as "modern" with a high-neck collar, puffed sleeves and an open back designed by father-in-law Ralph Lauren, of course. It took 100 craftspeople spending more than 3,000 hours hand-embroidering featherweight, antique ivory tulle with flower motifs and scroll designs using ivory silk and metallic thread, Swarovski Elements crystals, and off-white pearl beads. Gorgeous I say. I can't wait to see the rest of photos. I guess this week my blog is all taking place in the mountains....I think that's a sign. 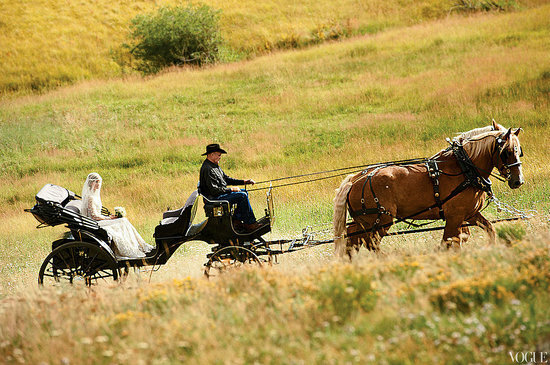 love these country weddings, how cute! I'm not really a fan of big cheesy themed weddings either but this looks gorgeous! The scenery is spectacular! iiiii wanna see more photos soon too!!! looks gorgeous out there! iiiiiii wanna see more photos soon too!!! it looks gorgeous out there! !